June 29, 2017 – Best Western Hotels & Resorts today announced that the Stratosphere Casino, Hotel and Tower and the Aquarius Casino Resort – each owned by American Casino and Entertainment Properties (ACEP) – will join Best Western’s rapidly expanding soft brand, BW Premier Collection® launched in 2015. Bringing these world-renowned properties into the Best Western portfolio represents the largest deal in Best Western’s 70 year history. The Stratosphere recently won 22 Best of Las Vegas Awards in the most recent Las Vegas Review Journal readers’ poll – the most of any Las Vegas Strip casino hotel property. Among the awards were Best View, Best Attraction and Best Fine Dining. Aquarius is the winner of eleven Best Of Awards from the Mojave Valley Daily News and 19 Best Awards from the Laughlin Buzz in 2017. For more information on Best Western Hotels & Resorts, please visit www.bestwestern.com. For more information on Stratosphere and Aquarius or to book, please visit www.stratospherehotel.com and www.aquariuscasinoresort.com, respectively. Stratosphere Casino, Hotel & Tower is a Las Vegas Strip resort with an 80,000-square-foot casino. 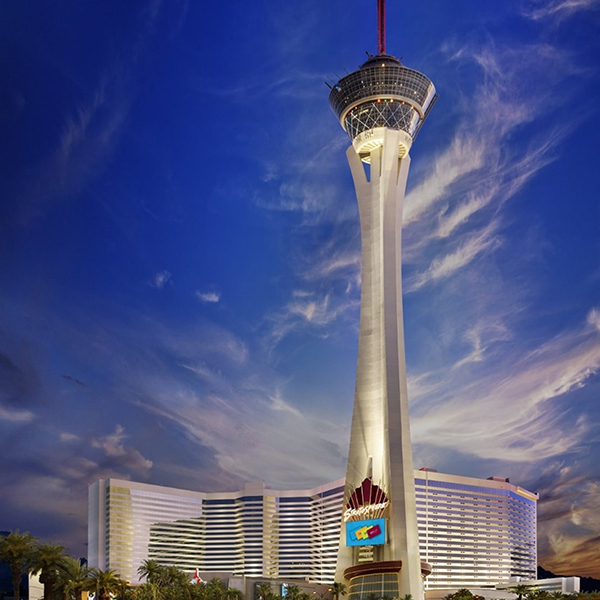 The 1,149-foot Stratosphere Tower is the tallest freestanding observation tower in the United States, featuring the Top of the World restaurant and highest view of the Las Vegas Strip from the Observation Deck as well as SkyJump Las Vegas and thrill rides Big Shot, X-Scream and Insanity. Known as a great value to gamblers, Stratosphere is located close to the Convention Center at the gateway to downtown Las Vegas. It features 2,427 guest rooms and suites, uniquely themed restaurants, the Tower shops, MJ LIVE, the world’s most successful Michael Jackson tribute show, The World’s Greatest Rock Show, and L.A. Comedy Club, showcasing the hottest up-and-coming stand-up comics. Additionally, Stratosphere’s ace | PLAY™ program allows players to enjoy awards, comps and exclusives based on their loyalty to American Casino & Entertainment’s four properties: Stratosphere Casino, Hotel & Tower on the Las Vegas Strip, Aquarius Casino Resort in Laughlin, Nevada, and two Arizona Charlie’s locations in Las Vegas. For more information, visit StratosphereHotel.com, call 702-380-7777 or 800-99-TOWER (998-6937).